An early start as we had a long drive to Palermo ahead. We bade a sad farewell to Villa Carolotta and made our way back towards the capital. The route we chose proved to be eventful as we encountered a huge amount of snow almost all the way back to the coast! The snow we saw in Randazzo on Friday had obviously returned in force over a very wide area as we drove through miles of very snowy scenery. We were really surprised that the Sicilians are remarkably efficient at clearing their roads of snow. Perhaps we shouldn’t have been so surprised for a nation that loves cars so much. The snow made for some lovely views and Bev took a few shots as we were driving along as you’ll see from the photos.Although the snow was lovely to see, it did slow our journey quite a bit so we only had a quick visit to Cefalu, which is the scene on the blog header. We had a bite to eat and then it was off again. We arrived at Palermo airport at 4p.m., delivered the car back to Avis and went and got on with all the usual airport bits. The flight was on time and smooth which is more than can be said for passport control which was quite painful. Still, it meant we had very little time to wait before our bags turned up and we were on our way home a little after 9. Another lovely holiday draws to an end. Grazie and arriverderci Sicilia. Another amazing breakfast which we took on a clear, bright but chilly morning. Etna showed itself more clearly today and we could see lots of snow and a hint of a peak. Having grazed our way through the bountiful breakfast on offer we set off out for a drive to a local gorge which sits amongst lemon and orange groves, about half an hour from Taormina. Unfortunately, part of the gorge was closed as the winter water levels were quite high and, uncharacteristically, the Sicilians were concerned about safety! We were both surprised by the abundance of labels, signs and information boards on the gorge walk. There were almost too many. Shock! Having had our walk around the gorge, we decided to head off towards Etna and see if we could grab some lunch en route. As we climbed higher, the weather turned very cold and snow started to fall. We were at about 1000 metres at this point so perhaps it’ not so surprising. We managed to find somewhere that served up a couple of lukewarm spinach pastries and waited for the snow to slow down a bit. Etna was, by now, shrouded in mist and cloud and was not coming out for anyone so we headed off back toward Taormina stopping to take a picture of a massive lava flow that seems to be very close to a village on the hillside. Antonio, Andrea’s friend, was talking last night about how bad things can get when a big eruption occurs. Catania airport, the closest one to Etna, is often closed and he said people have to wear face masks because the fallout gets into their lungs and even under their skin. It’s a great thing to see but clearly needs to be treated with great respect. Properties for sale..great outlook, warm and cosy, a good deal to be had for a short term commitment. The temperatures changed from 3dC to a more acceptable 8dC as we got into Taormina. It’s now turned cold and wet and, according to the chap who owns the hotel, unseasonably cold. He said that we should be having temperatures of around 20dC at this time. Whilst talking about the local weather, we asked him about an adjacent site that has a large, derelict building on it. It was apparently bombed by the Americans during the war and has been the subject of family arguments for years but is likely to be rebuilt as a new hotel. We then got to hear about a hotel that is almost next door to the one we’re staying in and the apparent flouting of building height restrictions by the local Mafia writing their own rules! “Only in Italy” the man said. The owners managed to add three more floors blocking out views to the sea, which is against local regulations…he’s worried that the Mafia (which apparently refers to the unofficial local Mafia, and not the one we all know), may influence the design of the bombed building. It’s strange and really upsetting seeing corruption working here. So, eruptions permitting, it’s packing up tonight for our long drive back to Palermo tomorrow morning. We hope to stop en route as there is an interesting town that Bev has found for us to explore. We probably won’t have time to blog tomorrow so we would like to thank you all for keeping us company in Sicily and hope to fill you in the bits we couldn’t write about for fear of upsetting the you know what!! The Belvedere, Taormina. Probably our last picture of Taormina before we head off home tomorrow. The rain clouds of last night were rolled away to leave another sunny morning. It’s been pretty windy today and has become colder as the day has progressed, with a couple of sharp showers interspersed with sun. We enjoyed another tasty and bountiful breakfast to set us up for our walk uphill, pretty steeply uphill, to Madonna della Rocca which sits above Taormina. There is a stepped path which is lined with the stages of the cross. Each has a burner so our guess is that pilgrims make their way up there at Easter. The views were spectacular, both on the way up and at the top. The church dates from the 12th century though it has been added to and altered subsequently. Slightly further up is a ruined castle. Both sit on the lower levels of a village called Castelmoro. The walk was accompanied by the sound of crunching underfoot from Etna’s volcanic ash which amazingly finds its way to Taormina and showers the town with tiny bits of black pumice. We found another, more overgrown stepped path to take back us down to Taormina and, once back, we spent time wandering through the city as we have really only been out in the evening so far. It is a bustling little place and has many interesting shops. We were tempted to have lunch in a very sunny spot and sat outside eating panini vegetariano and drinking a cocktail and coffee. After we had finished our lunch and we were sitting contemplating the view, the first rain shower arrived so we moved on. We came back to the hotel for a short rest and then headed back out to visit the Teatro Greco. As we hope you will agree from the photos, that was a wonderful visit. The site is beautiful, framed by Etna to one side and the sea to the other. Yet again, those Greeks knew how to choose a good spot. Most of what is left of the amphitheatre is Roman, but the Greek bits date back to the 3rd century BC. When we got there, a group of students were having a talk about the history of the place. A couple then volunteered to go to the stage and do a bit of acting. I wonder if they appreciated how many centuries have past since performances were first undertaken where they stood. The amphitheatre is still used for performances nowadays. On again to the public gardens, for which a Scottish woman was apparently largely responsible. They were really lovely and must be a glorious sight in Summer when many more things would be in bloom. We have met loads of German and French tourists in Sicily. Goethe liked Sicily and Taormina in particular, so perhaps that’s what they come in their droves. DH Lawrence lived in Taormina for three years, from 1920-23, but all you can see is a plaque where he stayed as it’s now a private house. We can certainly see the attraction. We are now back at the hotel waiting for Chris’ ex colleague to arrive. We hope he can answer our many questions about all things Sicilian. He probably thinks he’s coming for a relaxed dinner with an old friend! Just back from a very interesting evening with my ex colleague from our Leeds days who invited his friend along, who is a judge. Andrea and CJ worked for the same practice in Leeds. Andrea moved back home in 2001. Both of them were full of interesting info on the inner workings of Sicily and the odd ways of the Sicilian. We got a bit of information on the Sicilian legal system and how the lives of the people of Catania are affected by Etna. We spent so long chatting that we hadn’t noticed the poor restaurant owners waiting in the corner with their coats on, desperate to go home. It was only 9:30, but everything seems to start to shut at around this time…very civilised. It was great to catch up and understand a little more about this lovely island, and also fascinating to hear the same sort of frustrations being aired that we all feel about our own homeland. Amazing breakfast this morning. CJ even enjoyed the fruit; local red oranges, sweet and yummy. The calm of the breakfast room however was slightly disturbed by the arrival of a large French lady from the tiny lift and the clearing of the French throat in a manner only the French have perfected. 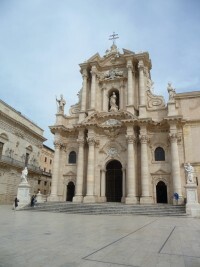 We decided to head off to Siracusa which we had heard good things about and were glad we did as it was quite lovely. It’s a mix of really ancient and ultra modern, nestled next to the Med. we managed to park in the oldest part of the city, called Ortigia, and set off to see the main sights. The most impressive was the Duomo (see pics) which was originally a Greek temple later developed into a church. Much of the original temple can still be seen and it has been restored beautifully. Ortigia is a mass of tiny streets, and a wonderful place. It felt quite special walking around somewhere where the Greeks had been roaming since at least the 6th century BC. Now, we don’t mean to sound ungrateful, but why can’t the Sicilians give proper information about what there is to see, where it is and why it’s there? We keep finding tourist information offices that are shut or have moved and don’t tell you where they have gone to. The three hour lunch break is a real obstacle to getting any information. The archeological park is a good example of this. We were given a terrible map that even confused the locals. Only after a lot of searching on foot did we find the Greek amphitheatre, one of the best preserved in Sicily. The site also contained an oval Roman amphitheatre where all sorts of gory going ons took place. Parco Archeologico an the Greek amphitheatre. Our drive back to Taormina was in the rain. We have just come in from our supper which we shared with the big screen event of the crowning of the new Pope, which is obviously big news in these parts; it’s such a big deal here, you could almost call it a religion! Bells rang out across Taormina tonight when Snr. Pope finally managed to come to the balcony in Rome. Although there was huge interest shown in the trattoria tonight to the new Pope, once he’d been seen attention quickly turned to the Italian’s other obsession and the programme on the big screen was speedily switched over to the football on the other side! Almost all of the restaurants we have eaten in here have rely the need to have the TV or the radio blaring out. The Sicilians don’t appear to do quiet. 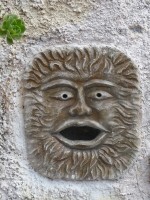 We are planning to have a day in and around Taormina tomorrow as there’s plenty to do and see locally. We made it out by 10 today – positively early! The breakfast staff were super efficient although Bev got fried egg when she’d asked for scrambled, an oversight that was corrected with a very nice apology followed pretty swiftly by lovely scrambled egg. Our journey was very mixed today, with lovely verdant countryside and grotty towns. There is something very disturbing about beauty interspersed with such ugliness and it is a real shame that the Sicilians don’t seem to care about how their built environment looks or what impact it has on their landscape. It’s quite normal to be in a beautiful rolling landscape with a sewerage plant or similar located in the centre of your view, belching smoke and interrupting the lovely scene. CJ is surprised by his admiration of the planning system in the UK as some things we’ve seen today would never be allowed in our highly protected and respected landscapes. We made very good time en route to our hotel and, as we could see Mount Etna from the autostrada, glowering amongst clouds and covered in snow, we decided to try to get a bit closer. This may sound stupid, but we were really surprised by just how enormous Etna is! It seems to go on for miles. CJ drove brilliantly on a small, windy road that became increasingly covered in volcanic ash the closer we got to Etna. At various points along the route we were right next to previous lava flows. Chris decided it would be good to collect some small pieces of volcanic stone to show you all so that’s something for you to look forward to! Luckily, he left the big lumps of lava where they were. Etna refused to show itself entirely; we just got sneaky peeks every now and then. It does seem to be smoking a bit, but we’re not sure if that’s situation normal or if it’s still erupting. We certainly didn’t see any lumps of molten rock being chucked into the air and we didn’t hear any rumblings. Weather permitting, we might go back and see if we can get any closer. The summit will certainly be out of reach because of the snow. 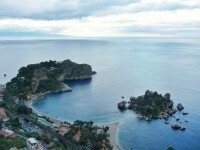 We arrived mid-afternoon in Taormina and what a gorgeous piece of Sicily it is. It’s set in the hillside of Monte Tauro at about 200 metres above the Med and is a medieval delight. We are pleased to report that Villa Carlotta is also delightful. 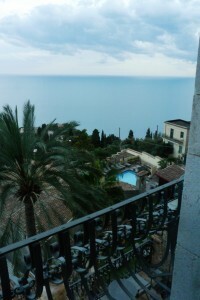 We were greeted in perfect English by Natalie who took us to the roof terrace for a cup of tea and some little home made pastries whilst she told us about Taormina and then showed us to our room which has sea views from the little lounge area and from the bedroom proper. We may just lie in bed looking at the sea until it’s time to leave. Natalie is the perfect saleswoman and speaks 6 languages, in case you need to know. She is about 20! (CJ – she really isn’t, she’s about 34 I’d say). The weather has been better than we thought today although a little chillier than the south west of the island. Indeed, whilst we were on our Scilian ‘passeggiata’ (that’s walking up and down a street chatting to friends to you and me), we felt a little chilly as the temperatures are at around 15dC at this time of year in the evening. (Sorry if this news is sickening to those that have had snow). Whilst on our passeggiata we were accosted by a very persuasive lady who insisted that we eat in her restaurant on Thursday evening (as they are shut tomorrow), so how could we refuse? Having driven some distance today, we decided to have dinner in the hotel restaurant tonight as we’re a little tired. The experience didn’t disappoint and as a plus point, another really lovely Sicilian wine – they do wine extremely well here. We have chosen our accommodation really well we think and, should we come back to Sicily this would definitely be a place to come back to. The only sting in the tail is the horrendous car parking fee that we have to pay – there are no parking spaces as Taormina is full of tiny winding streets that don’t really accommodate cars. We’re planning on a trip to Siracuse tomorrow which is a little further south on the coast and apparently a lovely place to visit – we’ll let you know. We had a lovely breakfast today which set us up nicely for our tour of the temples. Unfortunately, Bev’s hay fever has just kicked in so she spent some time blowing her nose at the temples! The weather started cloudy with spits and spots of rain, but improved by the time we got out. There are some advantages to being late risers. It has been cooler today though and, if the forecast is right, we are in for much cooler weather as we head for Taormina tomorrow. Anyway, we had a very interesting walk around the temples. It was remarkable to be so close to buildings that the Greeks had walked in during the fifth and sixth centuries BC. As you can see from the photos, they are in various states of disrepair, but have a great beauty; helped by the lovely warm colour of the stone. It’s almost impossible to imagine how they constructed the temples as the individual pieces of stone are enormous. Some of the stone has a red tinge, a sign of the fire damage caused when the Carthanagians sacked the site. They certainly chose a lovely place to build as there are distant views to the sea. 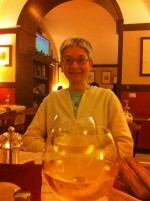 We returned to the hotel for a rest before girding our loins and heading out to Agrigento by car. First stop was the post office for stamps for postcards where we encountered a very nice customer who invited us to jump in as he was taking ages, and a hideous clerk who managed not to have any eye contact and wouldn’t write the amount down or let us see her monitor. The nice man wrote it down for us. 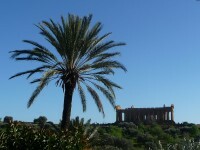 That set the scene for our tour of Agrigento for Bev. The Rough Guide said the town was well worth a visit and we usually agree with their write ups. Not this time. Their info about it being a very poor town where Mafia influence is still strong we can believe as we saw some really run down places, many for sale. There was one street that had every boutique in the town on it and it was filled with handbag and shoe shops. That was quite pleasant, but not worth an hour and a half of our lives. Agrigento seems to have as many churches as shoe shops and all of them seem to be falling down. The cathedral had a sign saying it was closed for maintenance. By the look of it, it must have been closed for years. We are venturing out for a meal tonight as we spotted a couple of restaurants when we were walking to the temples this morning. It won’t be a late night as we are off to our final destination tomorrow and that looks like quite a long journey. One thing that has interested CJ is the lack of English speaking Sicilians. I appreciate that there’s no reason why they should, but there are a huge number that we’ve encountered that don’t appear to have a single word of English….thank goodness our Italian is perfecto. We have found that by adding an ‘o’ at the end of proper English words, you can pretty much be bifocal. The view from our hotel – The temple of Juno in the Valle dei Templi. Driving today has been a dream with very few people around and mostly motorway-type roads. We were forced to take a really long diversion at one point which meant negotiating hairpin bends and precipices. The landscape is a mix of rolling green farmland and nasty industrial centres. There are lots of apartment blocks dotted about on the hillsides which are also home to orange groves, acres of olive and we think almond trees too. We were really hungry by the time we got back en route after our diversion and stopped for lunch in Ribera, a none too attractive town. We found a bar and had really nice slices of pizza served by a helpful young man with whom we conversed in a mixture of Italian from us and English from him. CJ decided to use the facilities before we left and ended up being Mr Mop! Because the tap wouldn’t work, he decided to turn a knob and water started pouring out from under the basins! He literally mopped to stop the water entering the kitchen. We aren’t expecting a return invitation from Ribera. 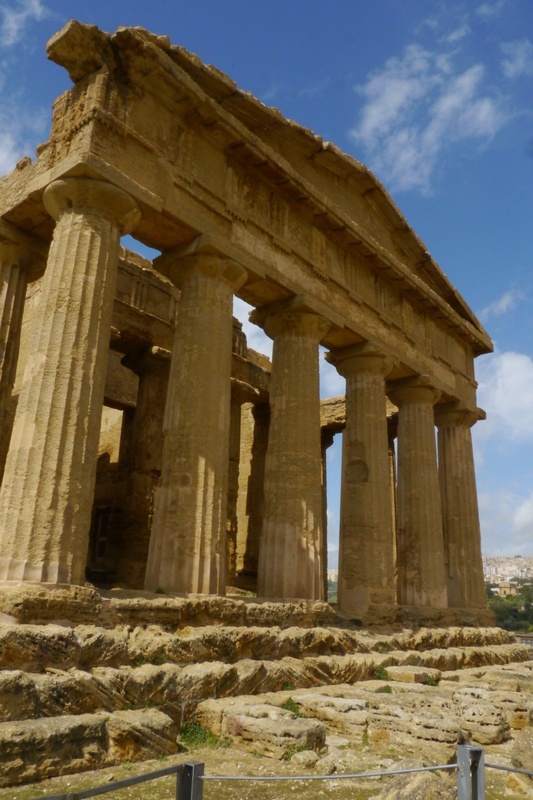 We have finally arrived at our hotel in Agrigento which is amazing and has a fantastic view of the Greek temples that are a short stroll away from the hotel in The Valle dei Templi. 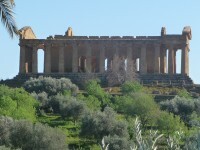 We are planning on visiting this, and if we feel like braving it, Agrigento itself tomorrow. We decided to eat at the hotel tonight and have just returned from a very nice meal. One of the waiters spoke perfect English and waxed lyrical about Sicilian wine. We have been very impressed with the wine we have tried so far. We will report on temples tomorrow. Day 3: Addendum to day 2! Not lemons as we know them captain. Just one thing..CJ would like to share the marvel that is, edible lemons. 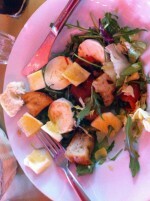 He had a lovely fresh mozzarella salad yesterday which was sprinkled with lemon slices. Much to his, non-fruit loving surprise, the lemons were delicious. Not sharp or petrol-like but sweet and smooth a bit like a grapefruit but much nicer. See picture for evidence. Last out again after experiencing a slightly surly waiter at breakfast and off we went into the warm sunshine of Palermo. It has been beautiful today, with clear blue skies and what felt like a UK summer day to us. The locals were wearing puffer jackets and scarves however! The city is amazingly quiet today, it being Saturday, and it was a pleasant change negotiating the route to the bus stop at Politeama. What a change from yesterday, being able to sit up top and outside on our way to the Botanic Gardens. It was a real treat and not being stuck in traffic meant a stress free trip. The gardens are part of the university and include a few large glasshouses and some really lovely trees and palms. We spent quite a lot of time trying to photograph the green parrots that whizz about overhead, but they were just too fast for us. We did manage to photograph the terrapins though as they came to sun themselves at the edge of a large pond. A lovely place that is a little piece of calm in this frantic city. Palermo’s cathedral, which is covered in an odd mix of different styles from Norman to Spanish gothic but has a strangely plain interior. The beauty and detail of the outside make you anticipate opulence inside, but that wasn’t the case. Our walk back to the hotel was a long one, having gone off piste a bit. We found ourselves at one point walking through a very rough bit of the city but we have both been surprised at the unthreatening nature of everyone; no one stares like they do in other parts of Europe and we have been pleasantly surprised by the lack of spitting, something the French seem to have taken on as a national pastime. Also, although Bev wasn’t so sure, I have seen fewer people smoking here. So finally we arrived at the hotel with aching legs. Chris had a snooze and Bev is readying us for the great move on tomorrow and the car hire experience! We may stop at a farmacia for some Valium! We slept really well and the Palermians were remarkably quiet which was a bit of a surprise. As per usual we were the last to breakfast and probably the last to head out. The morning was grey, mild and breezy and it wasn’t long before we encountered rain. We headed for the city sightseeing bus which we eventually boarded at a very popular city bus stop which was home to two dogs who ran out into the road and tried to attack police vans that had their sirens blazing. One of the dogs also seemed to have something against cyclists and people with sticks! The rain was pretty steady by the time we got on the bus so we were glad of the shelter and it was a good way to see the main sights and attempt to get our bearings. Palermo has hundreds of intersecting streets and you have to keep your wits about you to avoid getting hopelessly lost. Hard work for suburban dwellers like us. After a delicious lunch (we didn’t attempt to tell them this time) of really fresh and tasty salad, we set off on foot to revisit some of the sites we’d seen in the morning. The sun had decided to show itself by now and it’s been a beautiful and really warm afternoon. The old city has a real mix of architectural styles and there’s bits of Roman, Norman and Baroque cheek by jowl. We went into a couple of churches, one in particular was very beautifully decorated with friezes but they have been damaged by water. 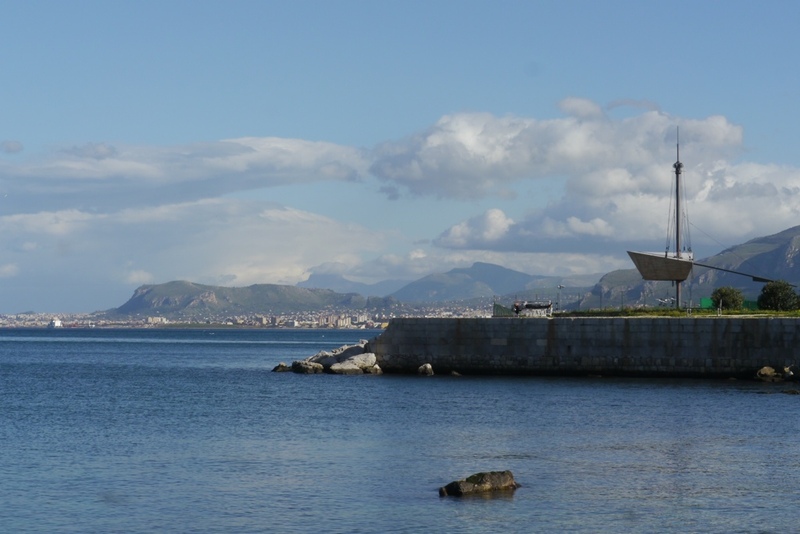 We also headed to the coast-it’s easy to forget that Palermo is by the sea-and looked out at the lovely blue of the Tyrrhenian Sea. We’ve got the hang of crossing the roads now. It’s just a matter of being confident and walking out in front of the speeding traffic! I think we will have to practice sounding our horn when we pick up our hire car or we will be easily identified as tourists. The Palermo pedestrian has been assigned to the bin. They are as important and venerated as a piece of litter, a nuisance, an inconvenience that interrupts the activities of the frantic, hurried Palermian driver. It is absolutely impossible to understand the rules of the street as the rule book has also been assigned to the bin; the car dweller never stops for pedestrians, they just slow down enough so that if they actually collide with you, they are travelling slow enough not to remove a limb, but stop….never. Tourists are treated with similar disdain and foolish be the unwary to think that a green man at a crossing means that they won’t aim at you and ignore the non-redness of the sign. Zebra crossings are for parking on and there is no such thing as a dropped kerb. In fact, no pavement is clear to walk along, it’s there to provide a place to park your scratched and dented Fiat or to set up shop, erect a bit of scaffolding or somewhere for a long chat in a group,just in the way. Just when you think you’ve mastered the crazy one way system, they throw in a mad counter flow down edge of the same one way carriageway, designed specifically to wake you up when you are right in the middle of crossing a four lane road. The buzzing scooter is everywhere; helmets, who needs helmets? Why, this must be the safest city in the world! Having said all that…..it’s a lovely, albeit confusing city. Lovely Sicilian wine, the holiday starts well! Chris was a little late getting home from pottery, (not that this caused any grumpiness you understand), but it was nearly 9 before we headed off to the Premier Inn in Reigate. Not a bad place at all really and surprisingly quiet for a hotel within shouting distance of Gatwick. So it’s off to get our flight today which will hopefully be a relaxed affair. See you again soon. Ciao tutti mondo, We’re hoping that means hello everyone but our Italian is pretty ropey so it’s anyone’s guess if it does or not. Our flight was excellent and even arrived early. Palermo is warm today and even though we arrived as the sun was just starting to go down, we both commented on how balmy it felt. We managed to find the bus to Palermo, despite having spoken in French to the ticket man! As so often when we travel abroad, our hearts were in our mouths as the drivers swerved around each other and seemed hell bent on their mission to on no account let anyone in for any reason and sound their horn repeatedly when someone had the audacity to try to join their lane. We were slightly trepidatious as we got off the bus and became pedestrians needing to cross roads with the same mad drivers on, but as you can see from this blog entry, we made it. The hotel is nice and, by Palermo standards, seems to be quiet. It is full of tour guides on a tour of Sicily. They were on our plane which is why we know that. The other big group on board was a teenage orchestra and choir, also on tour. They are playing in Palermo but seem to have no idea where they go after that. Having been here but a few moments, we are quite confused by the language. We have tried to communicate in our best Italian only to have people stare blankly at us. A group of diners who bumped into our table tonight apologised for doing so but failed to say “scuzi” or similar, but instead tripped out with something that neither of us understood. The waiter tonight was confused by our phrase ” era squizisitso” which of course is perfect Italian for “that was really nice” (food). We can only assume that our perfect Italian is just too refined for the Sicilians! We are now back at the hotel hoping for a quiet night, but the locals do like to exercise their horns in Palermo, so let’s see.